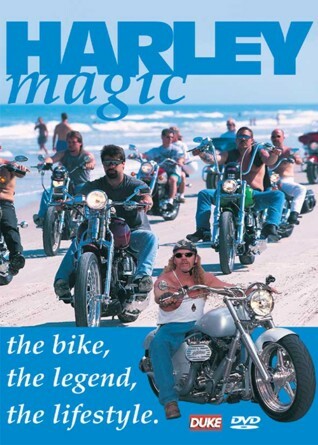 Millions of words have been written and miles of film made about the Harley Davidson motorcycle but this is the first serious attempt to try and define that Harley Magic. We go on the road with Harley riders in the USA, cruisin’ the back roads of California and the surfline of Daytona Beach, Florida. There’s awesome 170 mph action on the dragstrips, the Daytona Speedbowl and close-quarter bullrings of oval track racing where Harleys have been a mainstay of the sport for over 70 years. We also take a look at some of the Harley classics all using the famous twin engine that has always been the heartbeat of Harley Magic, and meet top custom men Arlen Ness, Rick Doss and John Reed and see their outrageous customised machines. And in a exclusive interview with Willie G Davidson, grandson of the one of the company founders and chief stylist, we find out how Harley survived some lean years to become the motorcycling phenomenon of the 90s.